With a fresh set of felony tattoos across her knuckles and no family or friends to miss her, Solara Brooks decides that a fresh start in the outer fringe is just what she needs. Someplace where she’ll be revered for her masterful engineering skills, rather than shunned for her looks. But with no money in her pockets, Solara resigns to indenture herself in exchange for passage. Too bad the only person who will hire is, is doing it to make her life miserable on purpose. Doran Spaulding, heir to the Spaulding Fuel fortune is spoiled, mean, and has always had it out for Solara. It isn’t long into her miserable journey that the tables turn and Doran is framed for conspiracy on Earth, and they find themselves both on the run from the law with an enormous price on their heads. When Solara said she wanted a new life, being on the run from the law with her worst enemy wasn’t what she had in mind. I had a few mixed feelings about this one. For awhile I wasn’t really sure where this storyline was going and if I was all that interested in it. But I enjoyed ‘Alienated’ and I trust Landers, so I held out to see where the story would build to. It was around the last 100 pages that everything started to really come together. Bits and pieces that Landers had laid along the way began to converge into the makings of an interesting and thrilling plot! 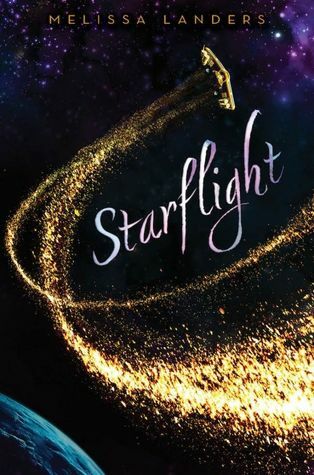 There were so many little story lines woven together in Starflight and it’s characters, and I’m very curious to see how everything comes together! Solara is the female character I have been looking for the last little while. She’s got the balance I’ve been craving. She’s skilled and tough, but she’s vulnerable and open. She’s just stubborn enough to get things done and not be annoying. And I like that she really is just average looking. Not the girl who just doesn’t understand how pretty she is or blah blah. And for all those things, I think she made a great protagonist and a great read. I felt like she was a solid, well-fleshed out character, but also someone anyone could see themselves in. I thought I had the twist figured out, but I was wrong. haha. And I’m always pleased when I’m wrong. While it took me awhile to warm up, Landers showed she knew what she was doing as she pulled it all together in the end. I enjoyed Starflight, but now that a lot of the foundations are laid tight, I predict the following books are going to be better and I can’t wait to read them.